After two years of discussion and drafting policy, Pitt’s Student Government Board submitted a proposal to SafeRider on Tuesday suggesting several major edits to the program to streamline the service for students, overhaul the dispatch system and use real-time GPS, among other changes. SGB submitted the proposal to Pitt’s Director of Parking, Transportation and Services Kevin Sheehy, who helps run SafeRider. SGB worked closely with Sheehy and hopes most of the suggestions will be implemented by next year. The idea originated from Vice President and Chief of Cabinet Rohit Anand’s time on the Facilities, Technology and Transportation Committee. Anand and current chair Dhruv Kohli decided to look into how SafeRider runs after hearing complaints from a number of students. “Our main goal was to make [SafeRider] more reliable and more efficient,” Anand said. In order to get a better understanding of how SafeRider works, Anand toured the SafeRider office dispatch center on the North Shore in the spring, and Kohli went more recently this semester. Pitt sources out the service to Lenzner Coach Lines, who also provide the buses that take students to Pitt football games and are used in the “Buses Home for the Holidays” program. One of the most significant changes in the proposal involves overhauling SafeRider’s dispatch system. Currently, one dispatcher answers calls, verifies the caller’s information and notifies them when the SafeRider bus is at their location. A single dispatcher can often get overwhelmed if multiple calls are coming in, which slows SafeRider’s response time. The solution to the inefficiency of the dispatch system may be to introduce an app system to request a SafeRider, according to the SGB proposal. An app would streamline the process for students and also allow SafeRider to respond faster, eliminating the need for a dispatcher to field and arrange every single request. SGB worked on the proposal with input from Sheehy. Both Sheehy and SafeRider were very receptive to SGB’s initial proposals, Anand said. 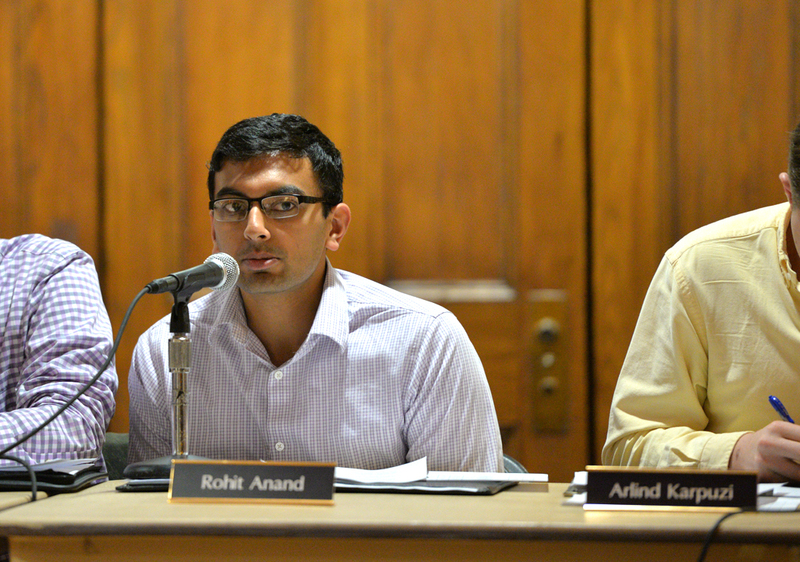 Some of the minor changes were implemented this semester right after the meeting Anand said. For example, instead of relying on paper schedules for current shuttle locations, the proposal suggested utilizing the GPS on the SafeRider to give students the exact location. The major changes, like introducing an app, will require a closer look at cost and viability, but Anand is optimistic based on the response so far. It is unclear how much an app would cost, but the University is looking into how feasible that would be. The University has also reached out to Uber to see what they could offer to the process. Any sort of action would have to be approved by Sheehy. In other news, Vice President and Chief of Finance Max Kneis introduced two new initiatives aimed at helping student groups at Tuesday’s meeting, one addressing catering and the other addressing funding. One initiative involves making University catering easier to understand for students. Currently, the catering menu that student groups receive is meant for all University units and departments, not specifically student groups. Student groups can receive discounts on these items, which is not clear in the current format. This initiative is meant to help student groups work within their budget, Kneis said. Kneis’ second initiative is creating a document that describes methods of alternative funding for student groups. The document would give student groups a guide of how to find funding outside of SGB through grants and other sources, like fundraising and private funds. There are several mini-grant programs like the OCC and Year of the Humanities grants available to student groups. Once completed, the document will be posted next semester on the SGB website where all student groups can access it. Chess Club: The Chess Club requested $3,516.70 to attend the Pan American Competition in New Orleans. SGB agreed to fund $2,820 after amending discussion.